I can’t help but remember back to 1989, when the Tim Burton Batman film swept the box office. This prompted a whole slew of Batman-related products to hit the market, and consumers worldwide bought them en masse. Unfortunately, Batman merchandise completely tanked when they were re-released for Batman Returns. It appears that this summer’s The Dark Knight, another Batman sequel, still has merchandizing potential. A company called Pop Gadget is putting out a slough of Batman products including Iron-on patches, 3D Magnet Heads, LCD Watches, and the Bat Logo MP3. The Bat logo MP3 Player has 1GB worth of memory, which is enough for about 240 songs. All of this fits into a 7 centimeter housing shaped like the famous bat logo, and has a cool blue outline. As far as I can tell, the head mounted video viewers haven’t exactly made a killing in the consumer electronics market yet. The myvu put itself on prominent display at CES Las Vegas this year, and you can read about that on our Sister Site. The Vuzix iWear VR920 was also on display at CES, and it looks somewhat promising. This next candidate in this growing head mounted video market is the i-Bean. 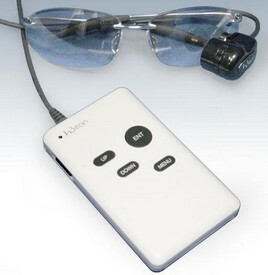 This one is different from the other two aforementioned products because it is not goggles, but an attachment for regular sunglasses or regular glasses. All you have to do is suction cup them onto your usual eyewear. The i-Bean says that it produces an image that is equivalent to a 21 inch screen from a distance of one meter away. It even has a built in TV tuner, but I’m not sure that it will work when the big HDTV changeover occurs. 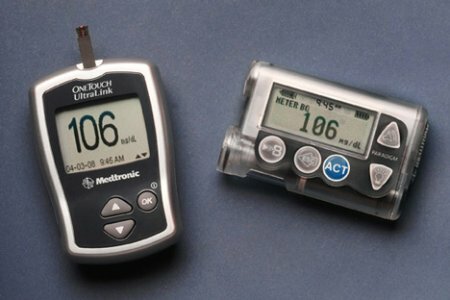 The OneTouch UltraLink Meter has recently acquired FDA approval, and this glucometer from Medtronic boasts wireless information transfer using a proprietary protocol to the MiniMed Paradigm insulin pump, hoping to achieve a tighter glycemic control in the end. Sounds like a much more convenient method of checking the glucose level in one’s blood, helping to make bolus dosing more accurate and much more convenient for patients when compared to manual entry of blood glucose readings. Read on more about the OneTouch UltraLink Meter after the jump. Competition Time – Win a shiny new Bluetooth Sony Walkman! Sony is giving one of our readers the chance to win the fantastic new NWZ-A829 Walkman Video MP3 player. Packed with features and weighing a mere 58 grams this new arrival will store up to 16GB of music, video and snaps. It even has built in Bluetooth® stereo, so you can listen to your music without the hassle of getting tangled up in those pesky headphone wires. Question 1: What is the ‘special blue’ key feature of the NWZ-A829 Walkman? Question 2: What is the LCD screen size of the NWZ-A829Walkman? Question 3: How light is the NWZ-A829 Walkman? Once you have the answers, simply send them to us via our contact form or email “contests@coolestgadgets.com” and if you’re feeling nice you could always tell a friend about the contest. Contest closed. Read moreCompetition Time – Win a shiny new Bluetooth Sony Walkman! I know that I spend more on my electric bill every month than I probably should. But with as many computers as I have running in my house, it’s not really a surprise. I can easily pinpoint where the main power drains are coming from, however, some people prefer to know exactly how much power some of their larger equipment uses. 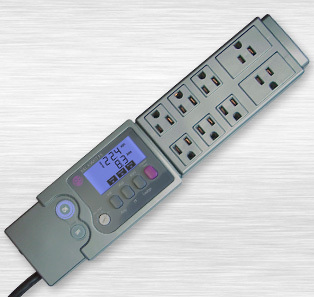 Here’s a cool power strip that will tell you how much energy each individual device in an area uses. So, picture this. You and your friends have decided to reunite your old highschool punk band for a second coming. A second jab at the musical stardom that you and your buddies dreamed about in history class. Though this time around, you’ll be damned if you’re going to record on a 4-track cassette recorder. 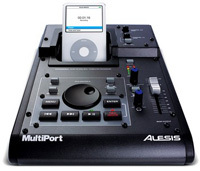 The $200 Alesis Multiport brings the power of recording into the new technological age of portable media. No more clumsy cassettes or memory cards, the Multiport records directly to your 5th generation iPod, 2nd or 3rd generation iPod Nano, or even your PC via USB, sending your tunes directly to your DAW of choice. With so many different wireless technologies around today, there is still one place that way too many cords are found, and that’s behind your TV. For some people, they have multiple gaming consoles, home theater receivers, cable TV and more running back there. Well Sharp has finally stepped up to the plate and created a device for their high-end TVs that will eliminate all but your power cord. Have you ever been so mad to wake up in the morning that you smash your alarm clock? Hopefully you don’t do that every day, or that would be one expensive habit. However, you could purchase the Throw Alarm Clock, a special type of alarm clock which actually requires you to bounce or throw it in order to switch it off. As you can see, the Throw Alarm Clock is a cushioned ball with an LCD display. It also has all the features of an alarm clock such as a time, date, as well as an hourly chime and the aforementioned alarm. 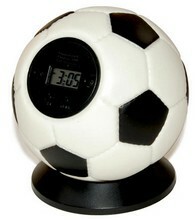 This Throw Alarm Clock is available in several sport ball shapes such as Cricket, Golf, and Football (aka Soccer). It also comes with a circular stand that mounts the ball, so it will not roll off of the nightstand.